I was so excited to share my new Keto Lasagna Recipe with you yesterday! 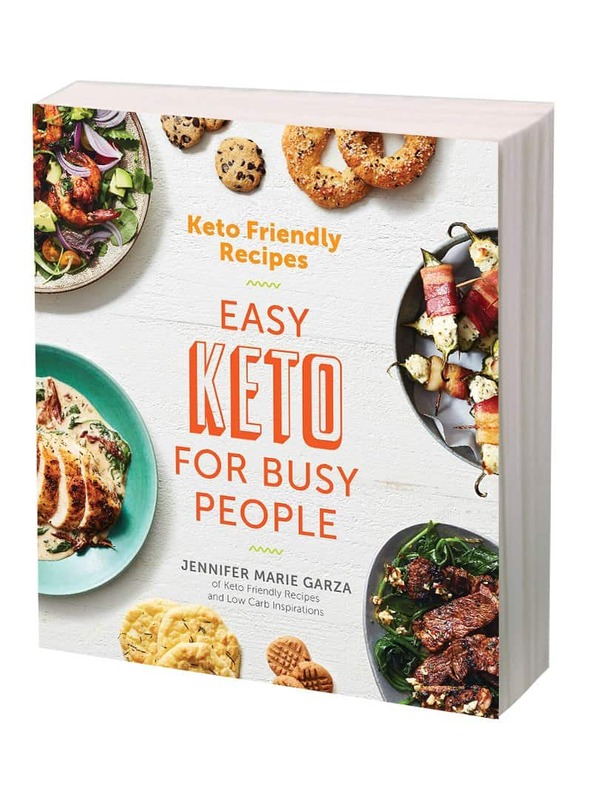 In fact, it went crazy on the Keto Friendly Recipes Facebook page too but… there was one problem. The no carb cheese wrap I used in my recipe was not available in your location. The FOLIOS Cheese wraps are new and only available in a few locations. 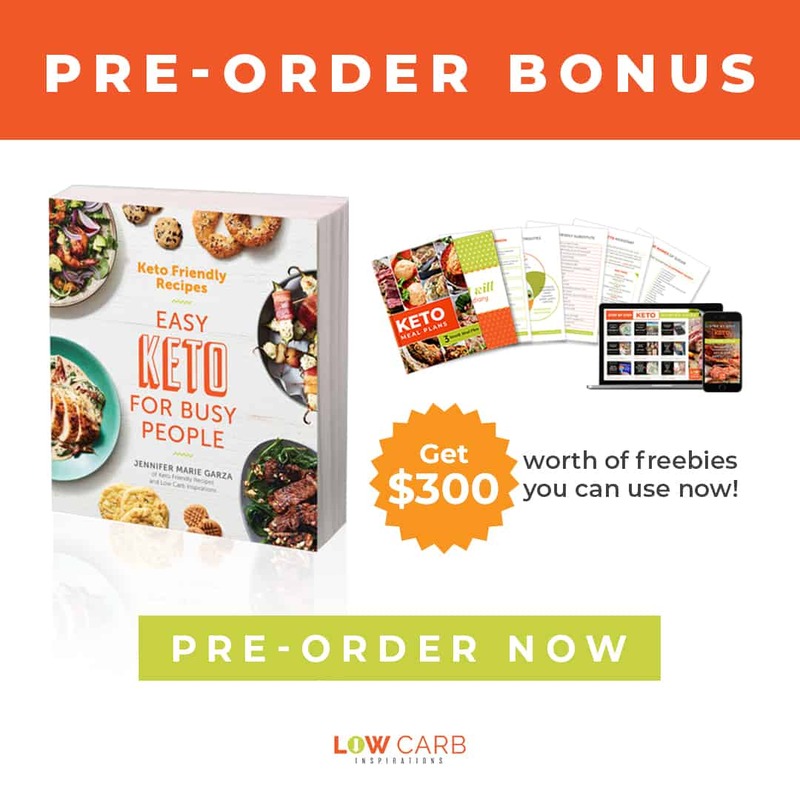 This can be frustrating especially since you really want to make that Keto Lasagna recipe that is so darn good! Guess what?! I have a solution for you!! 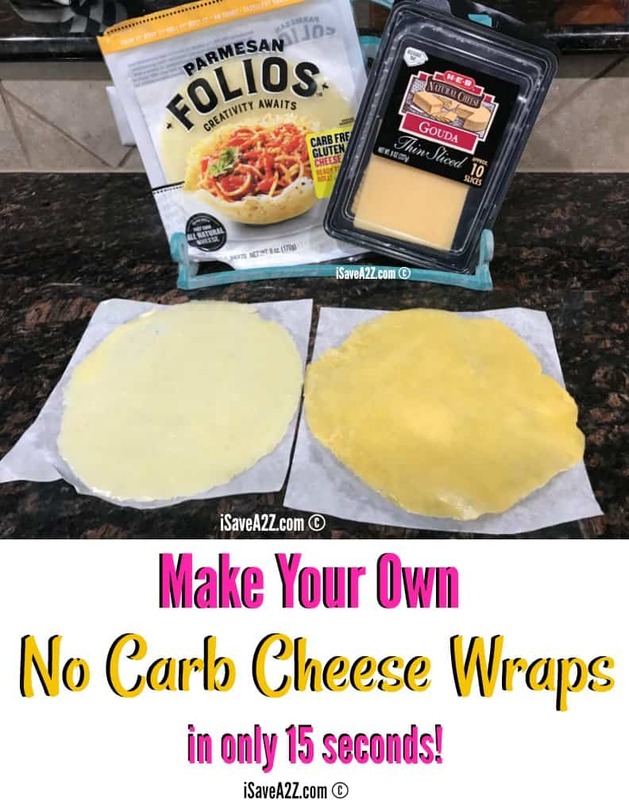 I have a way for you to make your own No Carb Cheese Wraps in only 15 seconds!!! I’m so excited to have figured this out! One thing to note though, Folios calls the Carb Free or No Carb but there are carbs in cheese! When you make your own, be sure to note the nutrition label and calculate the carbs for the cheese you plan to use. Here’s how you make these no carb cheese wraps. 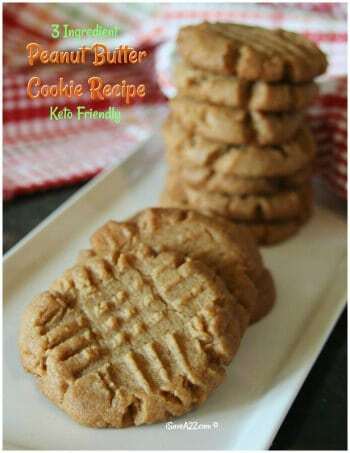 Be sure and grab the printable version of this recipe at the very bottom of this post. Oh, and if you want to join a special group on Facebook where we share all kinds of good information, you need to request to join the Low Carb Inspirations group here. 1. Start by folding the sheet of parchment paper in half. 2. Open the folded sheet of parchment paper and place a single slice of cheese in the center. 3. Fold the second slice of cheese into 4 different equal size strips of cheese. 4. Place the small strips of cheese around the first slice of cheese on the parchment paper. 5. Microwave it for exactly 15 seconds. 6. Remove it from the microwave. 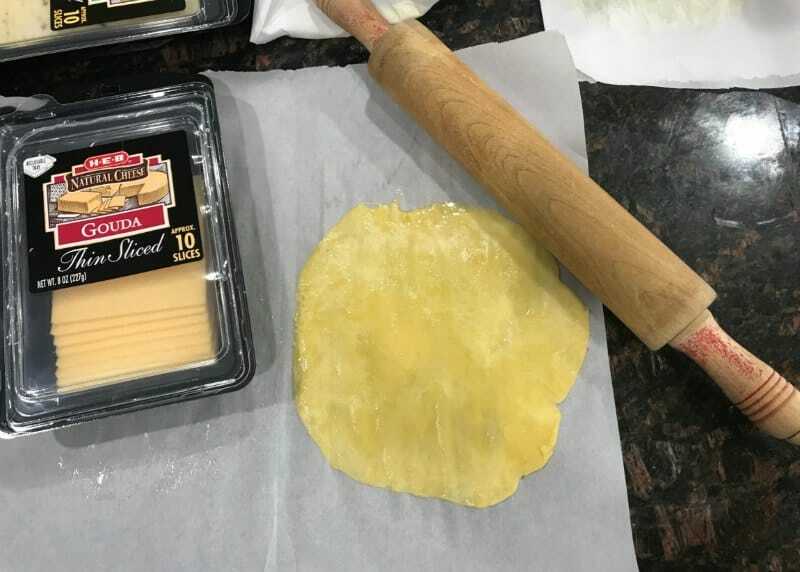 While the parchment paper is still folded in half, use a rolling pin to spread out the cheese into a thin circle wrap. You don’t need a rolling pin, you can smooth it out with the palm of your hands too. The cheese will be warm and not too hot. If you microwave this for more time, it will crisp the cheese. You want the cheese just warm enough to mold it together into the shape of a tortilla wrap. 7. 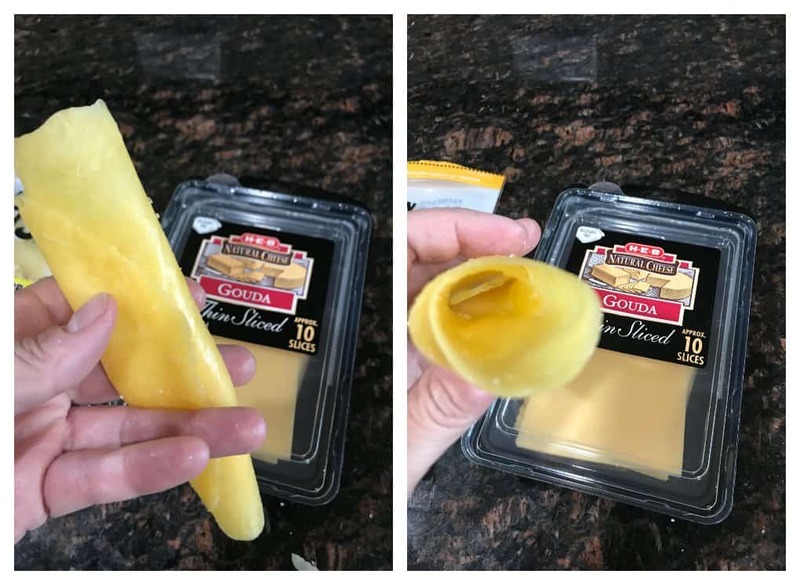 If you want to use the no carb cheese wrap immediately, you will need to cool it in the freezer for a couple minutes. It must be cooled down before you use it. When it’s cooled, it will keep its shape. The cooled no carb cheese wrap will also be strong enough to roll too! I tend to keep my no carb cheese wraps in between the parchment paper and stored in a large ziplock bag in the refrigerator. Here’s the exciting part!!! 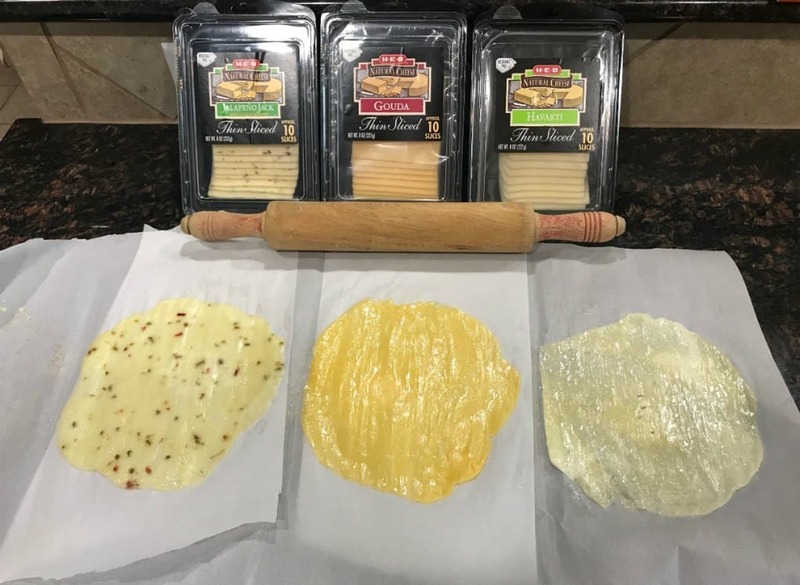 I made so many different flavors with all kinds of cheese! They all work the same! The Sharp Cheddar (inexpensive generic brand) was a bit more greasy than the rest so I did have to use a paper towel to dab off the excess grease but I didn’t have to do that with the rest of the cheese flavors. I used two slices of cheese per no carb cheese wrap that I made myself. If you only use one slice, the wrap is kinda small. To make it exactly like the FOLIOS cheese wraps it requires two slices for the same size and thicknes. If you don’t want to use a microwave, I’m certain you could heat this up in the oven. I have not tried that yet myself. If you do try it, you will want to make sure to set it at a low temperature so the cheese doesn’t crisp. You want it just warm enough to slightly melt the cheese square so that you can form it into a tortilla shaped wrap. 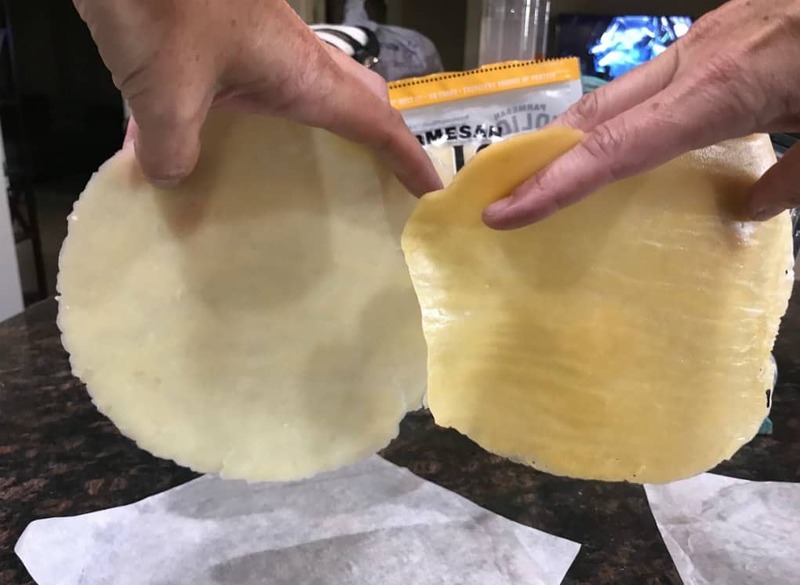 I’m excited to share this technique with you because you can make these no carb cheese wrap tortillas at home right now for less money than what you would buy them for in the store and you can make any cheese flavor you want! And yes, those FOLIOS cheese wraps are expensive at 4 wraps for between $5 and $6 depending on your store’s prices. 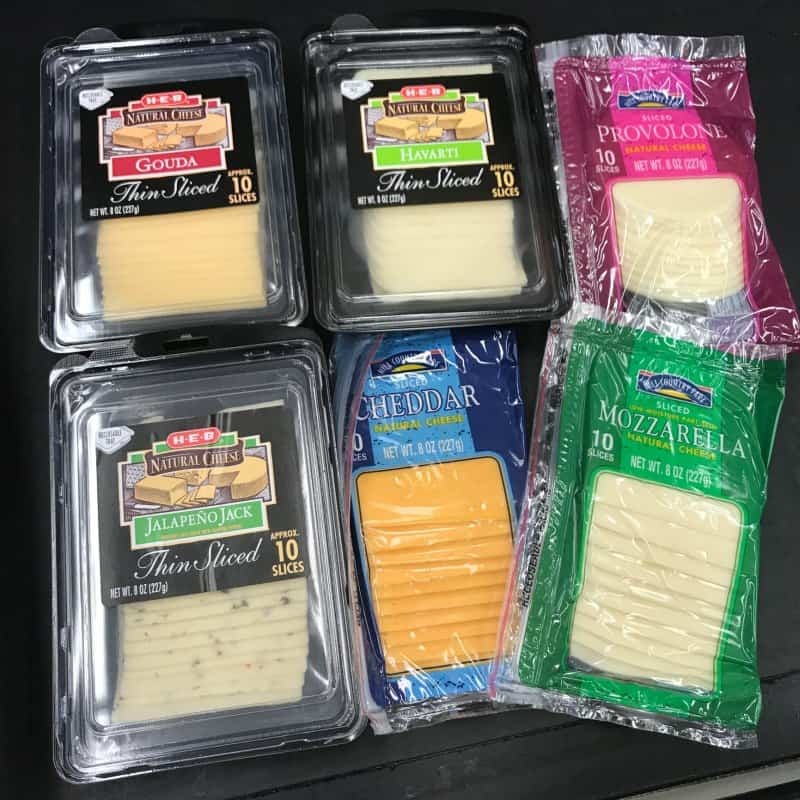 I can get a package of cheese with 8 to 10 slices for less than half of that cost! They are convenient though! 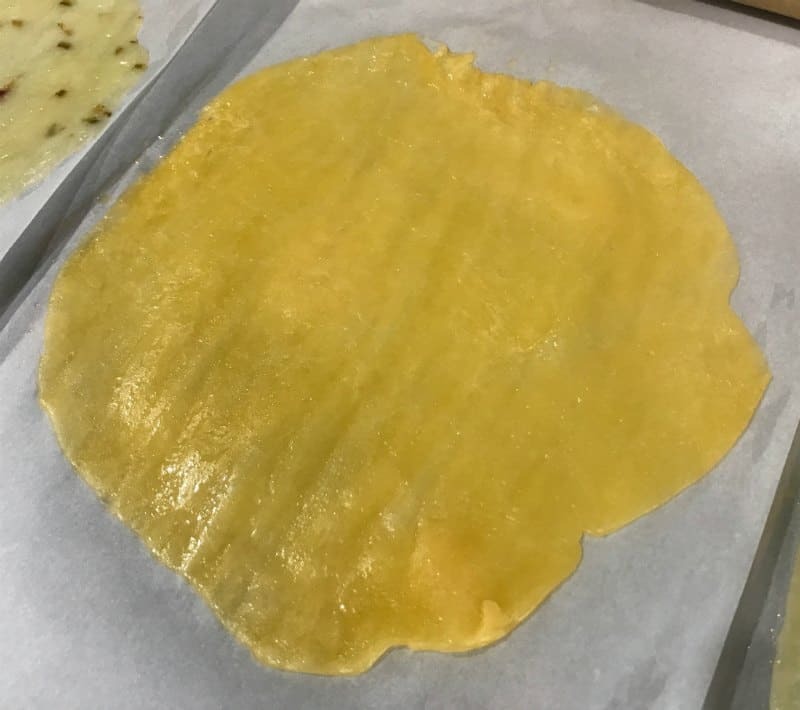 This is what the Gouda wrap looks like! This is the Jalapeno Jack wrap! Once they have cooled down, the texture is exactly the same!! This is a side by side comparison of the FOLIOS on the left and the Gouda wrap on the right! Here’s the Gouda wrap after it has completely cooled! It rolls up just like the FOLIOS No Carb Cheese wraps! YES!!! Be sure to share this technique with all of your Low Carb buddies on Pinterest too! Start by folding the sheet of parchment paper in half. 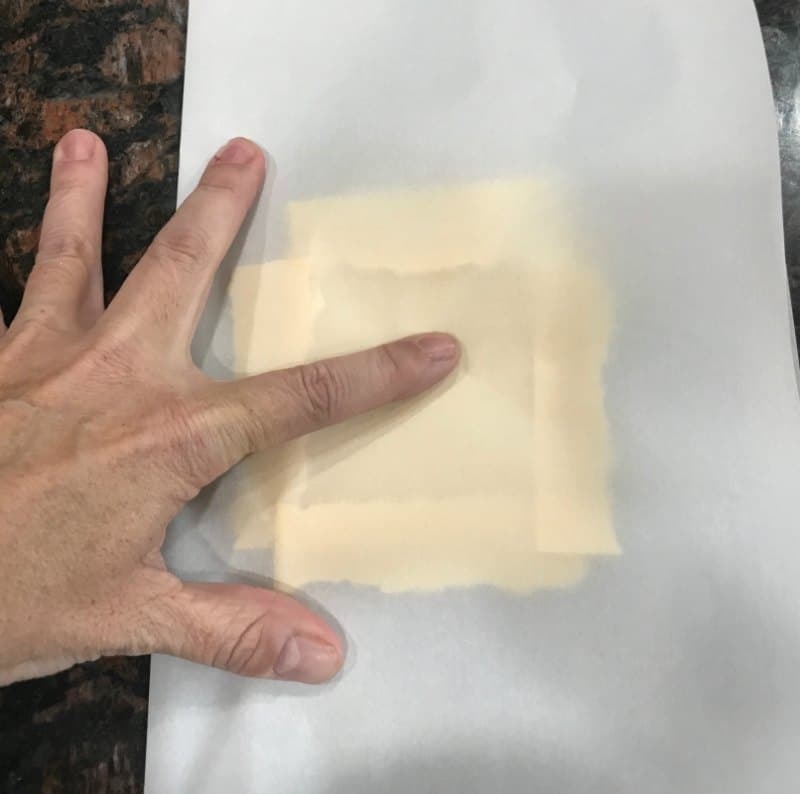 Open the folded sheet of parchment paper and place a single slice of cheese in the center. 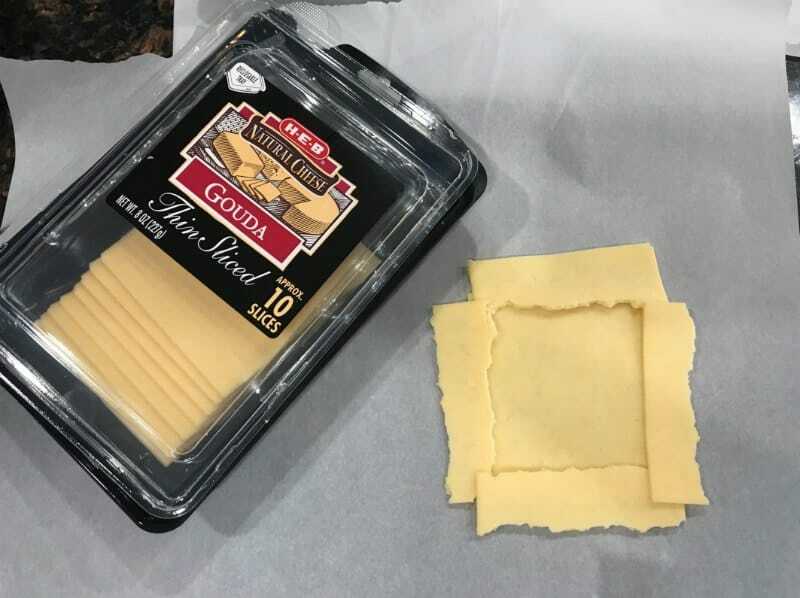 Fold the second slice of cheese into 4 different equal size strips of cheese. Place the small strips of cheese around the first slice of cheese on the parchment paper. 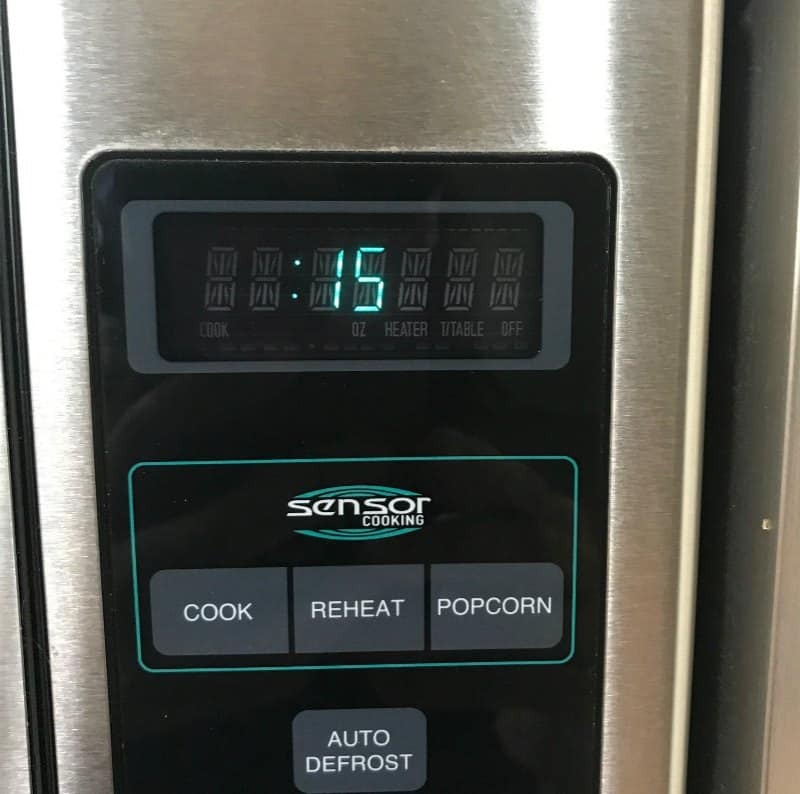 Microwave it for exactly 15 seconds. Remove it from the microwave. While the parchment paper is still folded in half, use a rolling pin to spread out the cheese into a thin circle wrap. The cheese will be warm and not too hot. If you microwave this for more time, it will crisp the cheese. You want the cheese just warm enough to mold it together into the shape of a tortilla wrap. 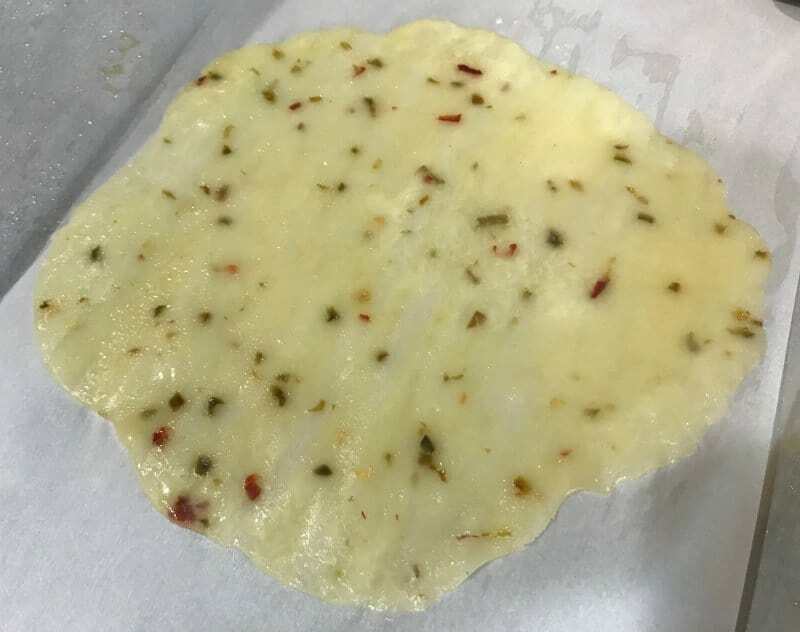 If you want to use the no carb cheese wrap immediately, you will need to cool it in the freezer for a couple minutes. It must be cooled down before you use it. When it's cooled, it will keep its shape. The cooled no carb cheese wrap will also be strong enough to roll too! 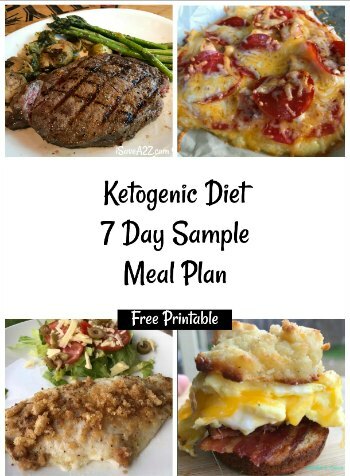 By Jennifer on July 21, 2017 Gluten Free, Keto Appetizer Ideas, Keto Breakfast Recipes, Keto Dinner Recipes, Keto Friendly Recipes, Keto Lunch Recipes, Recipes, Snacks, Weight Watchers. Thank you SO much for this recipe! We had Folios in our Aldi and they were gone the first day before I could even get there! This is awesome and just think of all the possibilities!! Brilliant! My hubby and I are just starting Keto and I bought the Folios at my local H-E-B. For that price, I’m so glad to have found a copycat recipe. Thank you!! P.S….I come from a family of law enforcement. I send Much love and respect to you husband. Such a great idea. Lovethe recipes I have seen so far. Keep up the good work. These are the BOMB! I tried it with Havarti and Roast Beef. Awesome!!!! It’s the name of a grocery chain in Texas. Not sure what other states they are in. The only super market in Texas. This is brilliant! Thanks for sharing. I can’t wait to try it. Oh, and I’ve lost 130lbs on an interval diet that includes keto as one of the phases. This is wonderful! And can change to be a “dorito” flavor by sprinkling with gluten free taco seasoning. If you want smaller tacos, omit the second slice. Love this idea! I wanted to watch your video, but there was no sound. Thank you Jennifer! 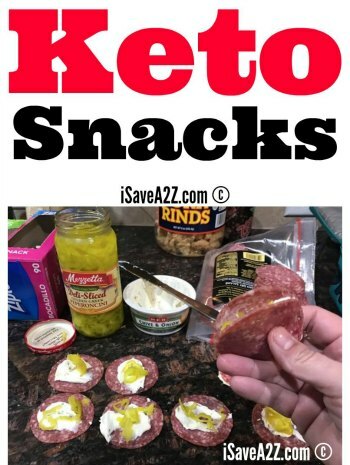 Love this because I use these in your yummy Keto lasagna recipe! i made these tonight with provalone cheese and filled with nitrate free hot dog, mustard, and saurkraut. So good! 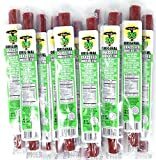 Has anyone tried this with American cheese? Thank you for these great ideas and recipes. 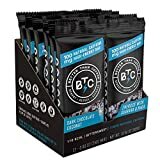 I’m new to keto and your info is invaluable!! Great recipe! Are you in Texas? I miss HEB since we moved back to Tennessee. Yes, I am in Texas! BRILLIANT ! ! I am a Showtime department manager at HEB, and we have events coming up for Ciao Italia using the Folios. I didn’t have a good description of the product, but this really great idea now that I know what it is. Definitely will try to make them at home though. Thanks ! ! Bend in Germany last 3 years,how I miss my store! Game changer! I made these work with shredded mozzarella. I just laid it on the parchment in the shape of a donut, warmed it up, and quickly moved it to the center. Rolled it out and it was perfect! Thanks! Mine were so thin they were transparent and very greasy. I let them cool on the counter maybe next time I’ll cool them in the fridge.